Artistꞌs rendering of NASA’s Juno spacecraft arriving in orbit around Jupiter. The orbital insertion is planned for July 4, 2016, coinciding with the United States’ celebration of Independence Day. 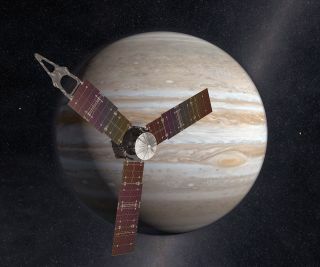 On Monday (July 4), NASA flight controllers will join mission scientists and managers at the Jet Propulsion Laboratory in Pasadena, California, to watch as the agency's Juno spacecraft enters polar orbit around Jupiter. If successful, the Juno team will celebrate the culmination of a nearly five-year voyage to the giant gas planet to study its atmosphere and origins. If this all seems familiar — NASA marking a mission milestone on the Fourth of July — it should. By coincidence of orbital mechanics and mission parameters, as well as a bit of creative flight planning, the space agency has given the country — and the entire world — an added reason to rejoice on the fourth day of the seventh (Earth) month going back more than 30 years. Here are some of the more memorable July Fourth events that gave a little cosmic oomph to the United States' birthday. 1968 — NASA's first fireworks display, or rather rocket launch, to coincide with Independence Day came the same year the agency put the first astronauts in orbit around the moon. Radio Astronomy Explorer A (RAE A) lifted off atop a Thor-Delta rocket from Space Launch Complex 2E at Vandenberg Air Force Base in California to study celestial sources of radio waves such as the sun. 1976 — Had history played out differently, July 4, 1976, would not only be remembered as the United States Bicentennial, but also the day that humans successfully landed a spacecraft on Mars. Instead, the touchdown of NASA's Viking 1 lander was delayed to July 20 after its intended landing site was deemed to be too rough for a safe descent. 1982 — It was a landing of a different type — by two astronauts on Earth — that drew the president of the United States to California on July 4, 1982. Ronald and Nancy Reagan were on hand at Edwards Air Force Base to welcome STS-4 crewmates Thomas "Ken" Mattingly and Henry "Hank" Hartsfield home after they landed aboard the space shuttle Columbia. The landing marked the end of the fourth and final orbital test flight of the reusable winged orbiter, leading Reagan to declare the space shuttle as "operational" going forward. 1991 — The first Fourth of July launch from Cape Canaveral, Florida, put the USA-71 satellite into Earth orbit atop a Delta II rocket to join the American GPS constellation. The satellite, also known as GPS IIA-2, was retired from service in 2011, but is still circling the planet today. 1997 — Two decades after Viking 1's planned Independence Day landing on the Red Planet was pushed back by 16 days, NASA's first Mars rover successfully touched down on July 4, 1997. The Mars Pathfinder rover Sojourner explored the planet's surface for about three months, laying down the tracks that would lead to the Mars Exploration Rovers Spirit and Opportunity and the Mars Science Laboratory Curiosity that followed (in 2004 and 2012, respectively). 2005 — NASA pulled off its first cosmic pyrotechnics on July 4, 2005, by slamming a probe into a comet that was millions of miles from Earth. To collect data about the icy body's composition, the aptly named Deep Impact spacecraft released a probe that smashed into Comet Tempel 1 at 23,000 mph (37,000 km/h), gouging out a crater about 500 feet (150 meters) wide. It was the first time in history that a human-made object interacted with the surface of a comet. The space shuttle Discovery lifts off on mission STS-121 from NASA’s Kennedy Space Center in Florida on July 4, 2006, marking the first and only time in the program’s history that a launch occurred on Independence Day. 2006 — The launch of space shuttle Discovery made for a particularly memorable Fourth of July as the orbiter lifted off from the Kennedy Space Center in Florida on the second of NASA's return-to-flight missions following the loss of the shuttle Columbia three years earlier. Mission commander Steve Lindsey, pilot Mark Kelly and mission specialists Mike Fossum, Lisa Nowak, Stephanie Wilson, Piers Sellers and Thomas Reiter of the European Space Agency spent nearly 13 days in Earth orbit, delivering supplies to the International Space Station and testing out safety techniques developed after the accident. It was the first and only Independence Day launch of the space shuttle over the course of its 135 missions. Robert Pearlman is a Space.com contributing writer and the editor of collectSPACE.com, a Space.com partner site and the leading space history news publication. Follow collectSPACE on Facebook and on Twitter at @collectSPACE. Follow us@Spacedotcom, Facebook and Google+. Original article on Space.com.